This city's name is spelled so many different ways -- Tzefiya (in the Talmud), Safad, Zefat, Sefad -- it's easy to get confused and think they are entirely different places. Regardless, if you see any of these on your itinerary, it's a place you'll want to visit. At an altitude of 2,790 feet (850 meters), Safed is Israel's highest town and probably its coldest. 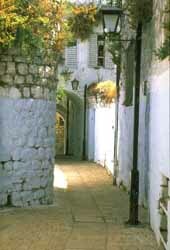 Safed did not become an important center of Jewish life until the late 15th and early 16th centuries. It is not mentioned in the Torah and was apparently not settled until Roman times. The Crusaders erected a citadel in the city, which, like most of their other structures, came under the control of the Muslim conqueror Saladin in the late 12th century. The Crusaders returned a half-century later and built the largest Christian fortress in the East, but that eventually fell to the Mamluks in 1266 under Sultan Beibars, who cut off the heads of the men and sold the women and children into slavery. Jews began to come in large numbers after they were expelled from Spain in 1492 (while Columbus was sailing the ocean blue). The city is most closely associated with Jewish mysticism, the kabbalah, whose foremost exponent, Rabbi Isaac Luria, lived and taught there. Known as "Ha'Ari" (the lion), Luria had come from Egypt in 1569 and died just three years later. The "bible" of the kabbalists, the Zohar, was written by the second-century talmudist Rabbi Shimon bar Yochai, who believed each word and line of the Torah had a higher meaning. The author of the main part of the Zohar was Moses de Leon (12th century) in Spain. Besides the kabbalists, Safad also attracted numerous other Jewish scholars and spirtualists, including Joseph Caro, the author of the Shulchan Aruch, Rabbi Moshe Cordovero and Solomon Alkabetz, composer of the Sabbath hymn Lecha Dodi. The Jewish community thrived in Safed for more than 400 years before the outbreaks of violence in Palestine provoked many residents to leave. The 1929 Arab riots stimulated a gradual decline that resulted in the Arabs becoming the majority in the city. When the British withdrew from Palestine in 1948 and handed the Citadel over to the Arabs, the remaining Jewish residents, backed by reinforcements from the Haganah, held off the Arab forces and kept the city a part of the new state of Israel. The city is a warren of cobblestone streets that lead to ancient synagogues. 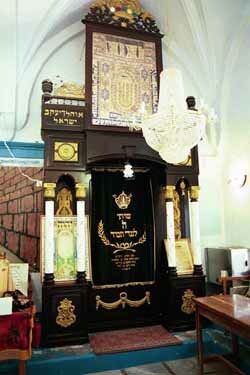 In the Caro Synagogue, named after the scholar, the Ark contains a Torah scroll that is at least 400 years old. Many of the doors of buildings in the city are painted blue to remind people of heaven. Another pilgrimage site, just outside Sefad, is the village of Meron. This ancient city is mentioned in the records of Egyptian kings who invaded the territory more than 3,000 years ago. A synagogue dating back 1,700 years was also found here. According to tradition, Rabbi Shimon bar Yochai hid in a cave in nearby Peki’in and wrote the Zohar. Though one Jewish family claims to have lived in the town since the days of the great Rabbi, today Peqiin is almost entirely populated by Druze. On Lag Ba'Omer, thousands of Israelis hike up Mt. Meron (alt. 4,000 ft.) to the tombs of Rabbi bar Yochai and his son Eleazer. People come to honor the rabbi, who is said to have died on this date, and many have picnics and go into the forest with bows and arrows. The following morning, three-year-old boys are given their first hair cuts. Meron is also the final resting place for the two great Talmudic sages, Hillel and Shammai. Down the Sefad road is the town of Rosh Pina, a name that means "cornerstone," which comes from Psalm 118: "The stone that the builder has rejected has become the headstone of the corner." You can also contribute to the greening of Israel by visiting the Jewish National Fund's Tree Planting Center just outside Safed. For a small fee, you can plant a sapling, a tangible contribution like no other you can make to Israel. A tyrannical Arab governor of Sefad ordered the Jews to bring him a certain number of white chickens or face expulsion. The Jews went to the grave of Rabbi Yossi Banai and prayed. Miraculously, all the chickens in the town turned white.